A quick scan of the colony on Saturday evening revealed a female Ringed Plover sitting low & tight, indicating that she might be incubating eggs. A closer inspection confirmed that she was indeed on 4 eggs, a full clutch! The nest was a typical Ringed Plover scrape, decorated with white & amber stones as well as pieces of white seashells. The nest was then given the rather imaginative name of RP1 (i.e. Ringed Plover 1!) and marked nearby with a coded stone so we can find it with relative ease & check on it’s status over the coming days. The female plover is still present & incubating today. Ringed Plover generally begin breeding well before the Little Terns do so it's no surprise that we have a nest with eggs already. Spurred on by the discovery of RP1, I gave the colony a thorough scan again yesterday. The strong Southerly winds that we're experiencing at the moment has meant that most birds out on the beach such as Ringed Plover, Little Terns, other species of wader etc. are all hunkered down & facing into the wind, making them all look like they are sitting on nests! One female Ringed Plover did look a bit unusual in her stance however, sitting upright with all her breast feathers fluffed out. This is typical behaviour of a bird that is 'brooding', i.e. keeping chicks warm or sheltered underneath it. When the wind died down a bit I approached the female plover who quickly scurried away & began her distraction display nearby. Sure enough there were 4 small Ringed Plover chicks (probably only a day or two old at most) huddled together doing their best to try & keep themselves out of trouble! The general are where the chicks are present was marked as RP2. It's great to get two pairs of Ringed Plover breeding already this early in the season. It should give them a good head start on getting their broods out & fledged successfully. We'll keep monitoring these two pairs & any others which attempt to breed over the course of the season and keep you guys updated on how they are getting on. I have found a nest with similar eggs on the beach. Hope they survive, as nest was very close to water front, bigger wind may flood nest with seawater. At least now I know, what are the birds laying them. 18,000 people who receive our e-zine, a monthly update about our work. 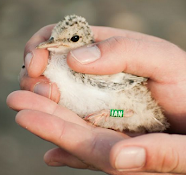 Have you seen a colour ringed Little Tern?